Think flat. Think thin. Think bigger. Think about a PC roughly the size and shape of a thick magazine. Think about scribbling notes on it, editing documents on it, sending emails or wirelessly shared files on it—all with the stroke of a pen. It's an interesting concept, isn't it? A PC you can tuck under your arm, slip discreetly onto a conference table, or hold like a clipboard as you walk through a warehouse, a field or a corporate corridor. The latest evolution in Tablet PC technology, the Stylistic ST5000 Series Tablet PC, delivers an unsurpassed level of productivity and performance. This innovative sytem based on over a decade of design, engineering, and manufacturing expertise, improves your business productivity with proven quality and reliability from the undisputed leader in pen computing. Improving on the award-winning Tablet PC, the Fujitsu Stylistic® ST5000 Tablet PC offers technology advancements to keep pace with the versatility of today's mobile professionals. With its added security features such as an integrated fingerprint sensor, dedicated Smart Card reader slot, imbedded Trusted Platform Module, security application panel, and a Kensington lock slot; your data and assets are more secure. In addition, new features such as display selections with up to 180° viewing angles and a built-in dual mic array with noise cancellation software empowers you to work wherever your work takes you. The T5000 includes Intel® Centrino™ Mobile Technology with a choice of three industry-leading display options - ST5020/ST5022 - 12.1" indoor display, optional 12.1" indoor/outdoor display or ST5021- 10.4" indoor/outdoor display. The T5000D includes Intel® Pentium® M Processor Ultra Low Voltage 733 with a choice of three industry-leading display options. Built-in wireless access and the latest Intel® Centrino™ mobile technology means you can instantly input and access information whenever, wherever needed. With the revolutionary thin and light slate form factor, the Stylistic® ST5000 Tablet PC provides the freedom to be more productive. The system is weight-balanced so it can be carried comfortably in either portrait or landscape mode. You can now compute on the go with ease, for longer periods of time. The slate is also the most flexible form factor. Use it alone like a notepad with minimal weight and bulk, or add a keyboard for a more familiar notebook feel. The optional portfolio or attaché cases make keyboard use even easier by providing a convenient easel stand. With the optional tablet dock, the system can be transformed into a complete desktop solution. The dock supports both Portrait and Landscape modes, tilts for better viewability and pen use while docked, and allows immediate undocking, letting you grab and go without rebooting. The tight interaction between Fujitsu design, engineering, manufacturing and service support creates some of the highest quality products offered in the PC market. In a time when most PCs are assembled by third-party vendors, Fujitsu takes pride in its own world-class design and manufacturing capabilities. In combination with a special pen, the electromagnetic (active) digitizer allows for a more accurate pen-driven input. The digitizer allows both hovering and variable pressure effects for smooth inking, increasing the overall user experience. Indoor (Transmissive) display—Viewability on this screen is designed for typical office and home work environments. The bright 12.1" XGA LCD display produces a high contrast ratio and complements applications that use high definition graphics. This display is like any typical notebook display. There are six intuitive and easy-to-use buttons that enable you to launch or navigate within applications. With one-touch launch buttons you can easily launch your email or instantly rotate your screen orientation. Each of these buttons also has secondary functions and two of the secondary functions are user-programmable. There are also four navigation buttons that provide up to eight navigation functions for increased efficiency. With its sleek design and solid feel, the Stylistic® ST5000 Tablet PC not only looks great, but will also stand up to the rigors of travel and everyday use. The magnesium alloy lower case provides significant protection over plastic casings found on other Tablet PCs. In addition, the hard drive is shock-mounted to protect your data. Fujitsu craftsmanship and quality are included as a standard feature on our Stylistic® ST5000 Tablet PC. With custom configuration available on all Stylistic® ST5000 Tablet PC models, you may either purchase your choice of recommended configuration or configure as-you-need-it with only the components that fit your needs and budget. Less than 1" thick, lightweight (3.4lbs) and, with its great high-tech design, the STYLISTIC ST5000 Series Tablet PC is perfect for working while standing and walking. Standard battery ; 12.77"(h) x 8.66"(w) x .82-.88"(d); Approximately 3.5 lbs. The Stylistic ST5000D supports an optional 802.11a+b/g wireless LAN. 802.11g is the next-generation in wireless LAN technology and offers transfer rates of up to 54 Mbps (nearly five times faster than the 802.11b standard). Fujitsu Siemens Computers has been designing, manufacturing and marketing pen tablet PCs for more than a decade and is recognized as the undisputed leader in the pen tablet PC market. We have learned a great deal about the technology and even more about the usage patterns of pen tablet PC users. We apply this knowledge and expertise to all our products and customer solutions. 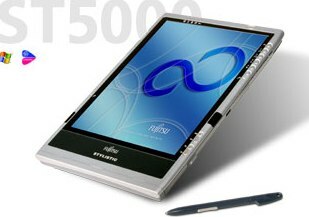 Fujitsu Siemens Computers, a pioneer in the tablet market, designed and manufactures its newly announced STYLISTIC ST4000 Tablet PC series. The tight interaction between our design, manufacturing, and service engineers creates some of the highest quality products offered in the PC market. In a time where most PCs are produced under OEM agreements, we take pride in having our own world-class design and manufacturing capabilities. With its 2.2 cm thickness and being close to an A4 size, weighing only 1.4 kg and its great high-tech design, the STYLISTIC ST4000 series is perfect for working while standing and walking. The Tablet PC has a robust design and a battery life up to 5 hours. An integrated metal frame strengthens the unit as well as it helps dissipating heat. The hard disk is mounted on shock absorbers for a real unit usable on the move. The Stylistic ST Series Tablet PC is currently shipping and sold through the Fujitsu direct sales force, Web site and channel partners. Pricing starts at $1,999(3) for a base configuration. Models with the indoor/outdoor display start at $2,199(3). Users can choose from several recommended configurations or they can customize the Tablet PC using the Fujitsu Configure To Order (CTO) program. The Fujitsu Stylistic ST Series Tablet PC is backed by a three-year or one-year International Limited Warranty for U.S. and Canadian customers. The International Limited Warranty includes technical support, 24 hours a day, seven days a week(4). In addition, users can add Fujitsu Premium Care Service Plans, which include an on-site service or a screen protection plan. All rights, including rights created by patent grant or registration of a utility model or design, are reserved. Delivery subject to availability; right of technical modifications reserved. All hardware and software names used are trade names or trademarks of their respective manufacturers.